LONDON, England (CNN) -- You might have thought that recycling is limited to paper, plastics and glass. Well, think again. A Californian company is developing a new technique for recycling carbon dioxide, or CO2, and turning it back into fuel. Carbon Sciences are developing a "breakthrough technology" to make fuel out of waste CO2. Their biocatalytic process converts CO2 into basic hydrocarbons - C1 (methane) C2 (ethane) and C3 (propane) -- which can then be utilized to make higher-grade fuels like gasoline and jet fuel. "We are very excited by what we've seen in the lab. We've had some promising results," Derek McLeish, President and CEO of the Santa Barbara-based company, told CNN. By employing biocatalysis -- using natural catalysts to perform chemical reactions -- Carbon Sciences hope to bypass the problem of inefficient energy ratios which can render many CO2 recycling projects pointless. "We don't use high temperatures or high pressures, which is a huge advantage in terms of scaling the project up," McLeish said. In the future, McLeish envisages Carbon Sciences setting up shop next door to large CO2 emitters -- coal, gas-fired plants and oil refineries -- recycling concentrated streams of CO2 discharged from fossil fuel plants. Trying to take CO2 out of natural air just wouldn't be worth it. "The beauty of this system is the whole infrastructure to distribute, to market and to use it is already in place," he said. "People don't seem to realize that ten percent of everything that comes out of an oil well doesn't go to the fuel industry, it drives the chemical industry. So not only are we facing a fuel crisis but the entire chemical industry is likely to cease to exist. So we desperately need to find ways of making basic chemical materials out of CO2 to keep the chemical industries ticking over. Professor North and his team are currently in discussions with some potential investors. He believes that Carbon Sciences' program sounds feasible. "They will need to address issues about how long the biocatalysts are active for before they need replacing. If they only work for a day then you are going to be getting through tons and tons of biocatalyst for each ton of CO2. "Biocatalyst life span and poisoning -- by things like nitrous oxide, sulfur dioxide and other impurities - will be the issues determining how feasible it is and how cost effective it is," he said. While McLeish doesn't envisage his biocatalytic technology being able to service the fuel needs of all motorists, he is confident that it can perform profitably on a smaller scale. "Transportation uses transportable fuels. We need renewables -- wind, tidal -- but these are not useable in the transport sector. One of the challenges in the future will be transportation," he said. "The grand vision here is to take waste, build it into a portable fuel and make it useful." The problem of rising CO2 emissions was highlighted again recently with the publication of the Global Carbon Project's Carbon Budget 2007. 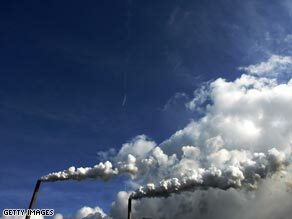 Concentrations of atmospheric CO2 have risen to 383 parts per million. A rise of 2.2 ppm on 2006 figures.